As I continue to ramble, sometimes alphabetically, through my 2000+ vinyl album collection, this had been sitting staring at me. It cleaned up nicely, and after editing, the tonality seemed pretty good. I’ve done a few personal ringtones before, it’s not complicated. This begged for one and here it is, wrappered at both ends by the iconic triangle. At 23-seconds its a bit on the long side, but still in “fair use” scope. AI straight at you from 1985. What I want to know is why are the only funny lines on this show, are the ones behind me? Hey, it’s Friday, I’m going to post a mix every Friday now of music that I like. At least for now, I’ll be posting link to other peoples mixes, but my aim is start putting together my own. As I continue through my “Vinyl to Digital” project, I’ve be listening to some great jazz. So my mix for this week. 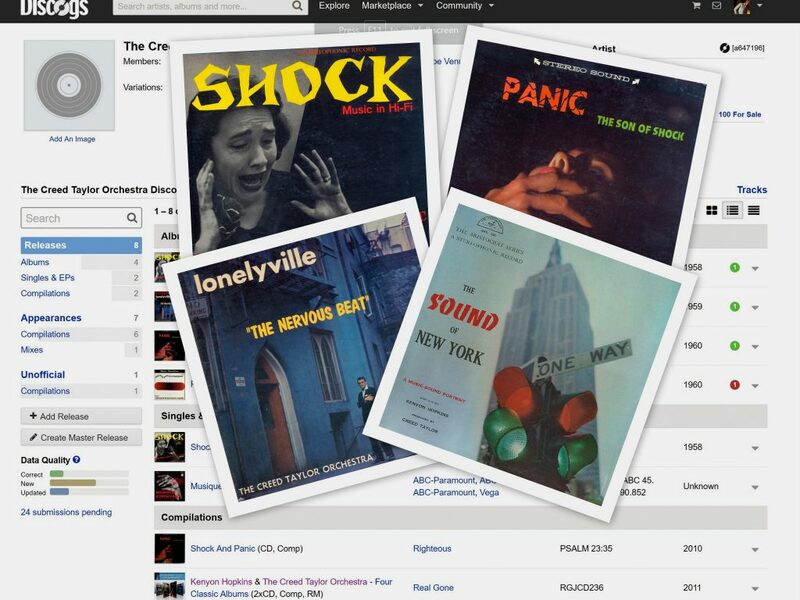 Vinyl the perfect archive medium? As I continue to digitize my entire 2,000+ album collection, I’m constantly amazed by the quality and durability of Vinyl recordings. 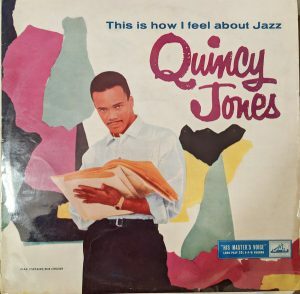 Quincy Jones, recorded in 1956, probably pressed 1957. The album is “This is how I feel about jazz“. It was recorded in 1956 exactly 1-year before I was born. It’s a mono recording, and this sample was taken from the album I own, a first pressing. admittedly I’ve cleaned and digitally enhanced the recording I made of the album. You can see pictures of the album and the actual vinyl on the entry in discogs via the link above. I have working players and readers for most media that I’ve ever worked with and owned. I don’t have working computer tape drives, the sort that we used on mainframes from the 60’s to the early 2000s, or the modern versions. Nor do I have an IBM Mass Storage System for a couple of the cartridges I own. Also missing from my collection is a Videocassette Player(VCR). Although I could get one, I have no interest in collecting video tapes. “Videos” as they became known are perhap the worst example of home tape use(more on this later). 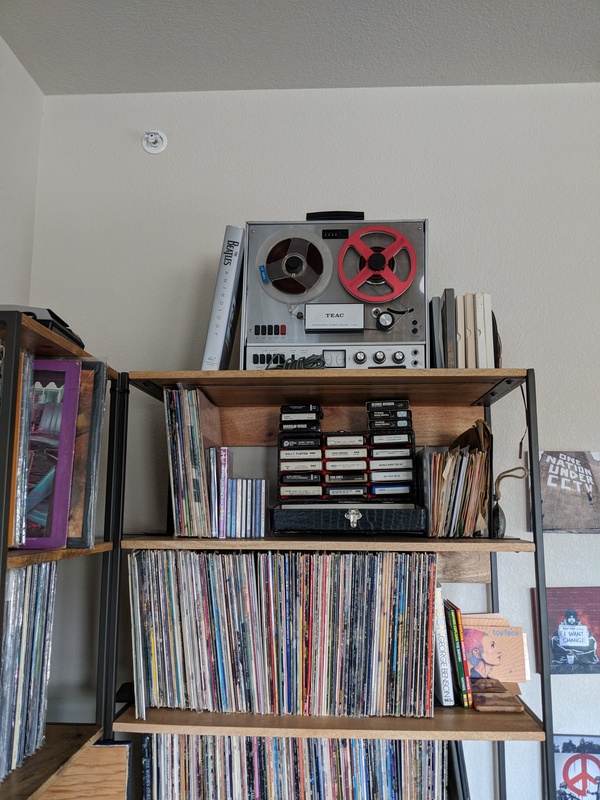 I do have two working reel-to-reel tape decks; a working dual cassette recorder/player; an 8-track player/recorder; a diskette drive: numerous CD, DVD drives and players; heck I even have a videodisc. All those formats though have their problems. Anything based on magnetic media, which would include tapes, cassettes and 8-tracks, as well as diskettes, can easily be ruined by putting them near or on top of something with a strong motor which destroys the magnetic encoding. They also suffer from read errors. Almost anything that uses tape, uses a rubber or silicone wheel to move the tape. They often usually need a form of tension to hold them in the right place to pass over the head in order to be read. The wheels are destined to either attract dirt, or worse, cleaning with the incorrect fluid, which causes the material on the wheel to become “sticky” or decompose, which causes the tape to stick to it and jam. Tape itself is also prone to decomposition, and wear. 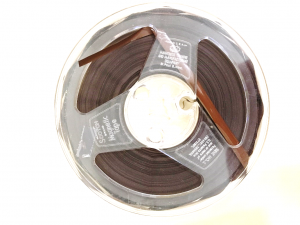 It’s not unusual to pick up old cassette or reel-to-reel tapes that have the magnetic material flaking off. Early “floppy” discs if stored correctly, are still useable, but since they have such small amounts of digital storage, really have no practical use. Yes, you can still get 3.5-inch diskettes and a drive, and the drivers are still embedded in Windows 10. The same can’t be said for 5 1/4-inch and 8-inch floppy discs. Again, these have so little space they are of no practical use today. Once we moved to laser based read/write heads and optical discs, a whole new era of problems opened-up. CD’s sold as the perfect solution and virtually indestructible, but in practise, they were so convenient they are used everywhere, and the surface quickly became scratched. While they can be re-polished and even re-surfaced, the problem with anything digital is that you depend on the error recovery built into the drive, and if it cannot read the data, and as explained in this video, be error corrected, the optical disc data just can’t be read. If the drive won’t read it, you can’t get at the data in order to correct it. I have a eight professionally produced and manufactured DVD’s from the early 2000’s that are on triathlon training. I decided it was time to see if they could be sold on ebay. Before listing them, I decided to play each one and ensure it was OK. The oldest of the DVD’s wouldn’t read on the external drive I use for my laptop, no matter what I tried, including simple repairs. It does play in a dedicated blu-ray DVD player. Frustrating. However, vinyl records always play, even if only poorly. Records suffer from four types of problems, each of which can be corrected, either digitally, or physically. The first is surface noise and clicks. Basic surface noise is easily removed provided you can find a section of the record that has noise and no music or sound. You simply sample the noise and tell the software, in my case, the excellent open source Audacity, to remove all noise as sampled. Clicks can also be removed, sometime just by software, other times by digitally editing the wave form, for the very small time period, reducing the amplification to the point where the click isn’t heard. Second, jumps. Where a record is scratched, if the scratch is deep enough, instead of the stylus gliding along the track, the scratch causes the stylus to jump one more more tracks. You can’t physically correct these, but given a digital copy, you can replace the bits. Small, identical sections, for example a few seconds from a chorus and can be cut and pasted over the original jump section. If that’s not possible, again, you can adjust the amplification to make the jump almost unnoticeable. When listening to music tracks, unlike processing digital data, or watching digital TV, at least in my experience, the faint sound of a jump is often missed as you are immediately processing/hearing the sound that follows. Third are warps. A significant warp or bend in a record requires careful heat treatment. I’ve had hit and miss with this, but on the couple of albums I’ve tried, I was able to heat and flatten the vinyl to the point where it was playable, and then required time to digitally correct the sound defects. Given the availability of cheap vinyl records on @discogs and ebay, it’s often worth just buying another copy. If you do decide to go down this route, you’ll need to carefully heat with a hairdryer, and then be prepared to weight in down with a heavy weight that is totally flat, like gym weights. Also it requires only very little heat and a lot of weight and, and time. I’ve taken two plus hours and yes, I’ve ruined a few by overheating, which causes the grooves to collapse. The warp will be gone, but so is the groove. The final form of damage is a crack in the vinyl. Success here depends on the original type of record. Shellac 78’s are easily glueable these days. It requires care and any seepage above the surface must be removed. It’s common the hear a loud pop as the needle passes over the crack on each revolution. 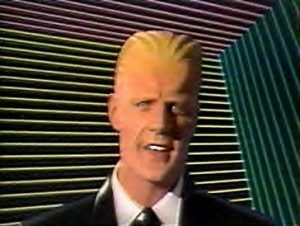 The pops can be removed digitally. And, yes, I do have a number of 78’s. Repairing singles/45’s if they have one crack, is often not necessary. 45’s tend to be thinner vinyl, you can place the record on the turntable, and assuming you have a felt or cork matt, gently push down on both sides of the crack and then play it and remove the pops digitally. Albums and singles can be glued. It’s better if you can, to glue just the edges and allow the capillary effect to get some of the glue into the actual crack. And that’s it. Apart from a couple of records that I failed to fix the warp on, I’ve never had a vinyl record I couldn’t make a passable digital copy of. 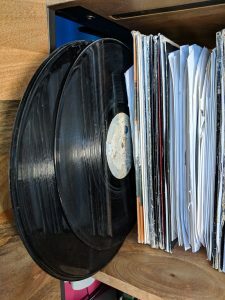 If you are interested in some ideas of how to physically recover, restore, rescue vinyl records, John Manship from the UK has some great tips. I have no plan to sell my vinyl when finished. They’ll just sit there in the corner of the living room, looking great, and a perfect archive. You can follow my vinyl to digital journey here, on twitter. Oh, one more thing. 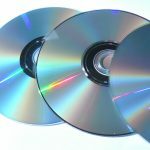 The ease of use and creation of CD’s also lead to massive counterfeit operations, and so while you might have thought that all the piracy action was online in digital files, it wasn’t. This case from 2018 year shows, one of the top sellers of CD’s on Amazon, was in fact selling fakes. You can read about it here or watch the news report here. So CD’s are easy to use, perhaps a little too easy! And yes, there was a period where bootleg vinyl records were common, less so today but still worth taking great care if you are buying rare records. Author Mark CathcartPosted on March 15, 2019 Categories art, culture, Life, mp3, music, technologyTags albums, cassette, CDROM, listen, mp3, music, vinyl, vinyl2digitalLeave a comment on Vinyl the perfect archive medium? Elements – Earth, Wind and Fire on Soul! Since finishing the book, and this blog post about Maurice White, I’ve been digging through some of my other archives. I found an amazing live performance from the groundbreaking WNET show Soul! broadcast on January 10th, 1973. The accompanying video, the shows are available via pbs.org in some regions, and via WNET Thirteen, if you can access them. A low res version of which can be seen below via Youtube, is perhaps remarkable for a number of reasons. It documents a group in the midst of change. The original Earth, Wind and Fire had recorded two albums for Warner Brothers, and then fell apart, as many groups do, with arguments over this, that, money etc. in 1972. This performance featured the core members of what had become EWF 2.0. Cleaves would move on, Ronnie Laws had billing on the recording, but had already quit, others would be added over time. This is the group, plus Andrew McKay, that would go on later in 1973 to record their 4th album, Head to the Sky. Their dress style hadn’t started evolving yet, here they were dressed, as you’d expect for early 1970’s, their performance style had though. As the last number finished, the group disappeared from the stage, leaving just Ralph Johnson. Musically, the group show what would become their trademark for the next 10-years, across albums and countless hit singles. The performance opens with one of the best videos of Maurice White playing the Kalimba; his fingers and thumbs rapidly producing what would become a trademark, and unique sound. Philip Bailey shows his amazing vocal range on, as far as I’m aware, their only recording of , James Taylors Don’t Let Me Be Lonely Tonight. There is, as there alway would be, the omni-present, bare chested, Verdine White and his amazing bass playing. The group is already tight and the tracks here, some from the 3rd album Last Days and Time including the opening song, Power. Overall, for me, this recording has all the elements that made Earth, Wind & Fire. Enjoy. Author Mark CathcartPosted on January 29, 2019 January 29, 2019 Categories culture, Life, mp3, musicTags earth wind and fire, EWF, living to music, maurice white, music, soul, soundcloud, WNETLeave a comment on Elements – Earth, Wind and Fire on Soul! Over the year-end I read the Maurice White, Herb Powell penned autobiography, “My Life With Earth, Wind & Fire”. It was both an interesting read, and revelatory. While my early teens were heavily influenced by David Bowie, my late teens and in some respects the rest of my life was heavily influenced by the sound, and especially the mystical guidance that seemed to be coming from the group, led by it’s founder and bandleader, Maurice White. White’s spiritual approach gave endorsement to my own uncomfortableness with my Christian upbringing and doubt that a single “God” existed. I never met White, but in the way you idolize someone, I thought I knew him through his music. I didn’t at all. The book itself covers all the key phases of his life, and especially the struggles and troubles he wanted people to know about. His youth in Memphis was shocking. Yes, I guessed it wouldn’t be good, as a black kid in Memphis in the 40’s and early 50’s but it was worse than a white kid from England born in the 50’s could imagine. In many ways, I assume the events described, meant that Maurice spent much of his life searching for meaning, and examining ways to find context for what had happened to him. As well as his long path through music until he hit success with Earth, Wind & Fire, the books chronicles Whites, obvious to me, struggles with commitment and identity. We all need stories in our lives to make sense of them, to understand why you are, who you are, and the book covers Whites journey to understand his stories. Notwithstanding all that Whites’ story really had some great commentary and lessons on surviving in the music business. Rocks Back Pages has a revealing and frank interview with Maurice, by Cliff White, from I assume London during the 1979 tour, which I attended. RBP also has a list of articles which contains some useful background. Surprisingly, NAMM, the National Association of Music Merchants (NAMM), doesn’t seem to have an interview with Maurice, but it does have interviews with Verdine White, Ralph Johnson, and Larry Dunn, all of which are really interesting and add great context. I came to Earth, Wind & Fire in 1974, via Ramsey Lewis Sun Goddess album in 1974 and then their Open Our Eyes album, and shortly afterwards, That’s The Way of the World. It wasn’t until a couple of years later that I saw them live, but in the “long, hot” UK Summer of ’76, I stopped one afternoon in Dunstable to get a drink. We’d been out at the disused quarry on the A5, practising motocross. I was riding my Honda XL125. Nextdoor to the corner store/newsagents I’d stopped at, was a tattoo parlour. Back in the 70’s tattoos were not the fashion items they are today, my dad had a traditional, simple knife and heart tattoo on his left arm, but few people I knew did. I walked in, hand drew the logo that I’d seen on EWF albums, and asked for a tattoo. Not only had the tattoo artist not seen the shape/sign before, I had no idea what it was. These days of course, with the pervasive internet, you’d just google and look up tattoos on pinterest and see what you can find. Of course these days I know it’s the astrological sign for Jupiter. Like many, my interest in EWF faded in the Mid 80’s as the group fragmented, and the focus drifted. As I work to digitize my entire vinyl collection though, I’ve once again found their tight music, soaring vocals, and inspiring lyrics a great launching point for many parts of my own story, which started on the 23rd night of September. Kalimba. Today is the 6th anniversary of the passing of Terry Callier. I’ve been meaning to write this in time for the anniversary of his death for at least the past 3-years. After really enjoying his Hidden Conversations album [youtube playlist], I put it on my to-do list and here it is. I’ve tried not to just repeat all the other obituaries and rather make this more of a retrospective. I don’t recall precisely when I became aware of Terry, sometime in the late 1990’s. Probably in some activity or performance around the 1998 release of his Timepeace album. My favorite Callier track, as I suspect many of his UK fan base was the eponymous Ordinary Joe, only bettered by the Nujabes 2005 album remix version. Terry and his music reminded me why, and rekindled my love of soul music. His style, reminiscent in many ways of Gil-Scott Heron, lyrics often protest or love based. The ying/yang of soul music. Callier, a Chicago native, he grew-up in the same Cabrini neighborhood as Major Lance, Jerry Butler, Ramsey Lewis and Curtis Mayfield also Charles Stepney, and via his early recording on Chess, house drummer Maurice White, who with Stepney went on to create the Earth, Wind and Fire sound and extravaganza. That area of Chicago was a petri dish for soul music. Callier though was largely undervalued and overlooked in the US. His style, his music, and his personality didn’t fit into a music business stereotype. Part preacher, part activist, gentle soul, unassuming, and real Dad, Callier was renowned for making short term decisions based only on what was right. He effectively quit the music business in the mid-80’s to become a full time Dad and support his daughter who decided she wanted to stay in Chicago and attend high school there. By the mid-90’s though, Callier got caught up in the whirlwind of being an American black musician is the UK. It’s something that happens to you, and for you, if you let it. Unlike the American music scene, where you still have to fit into a predetermined stereotype, and your music has to be classified within a narrow band, so it can be sold across a vast market. It Britain, your music has to be good, not exceptional, and YOU have to be adopted, and malleable enough to adapt to the your adopted market. A great current example of this is Gregory Porter. He’s already Nationally famous in the UK, sells out the largest venues and can regularly be seen on TV. He is even front man for his own series on the BBC, Gregory Porters Popular Voices. Callier was not just exceptionally authentic, after years of neglect by the US music industry, he was excited to absorb the admiration and inquisitive demand from the UK music industry, and especially the artists. Calliers music blossomed, not just his past work, but his future work. The story of how Acid Jazz founder Eddie Pillar contacted Callier and brought him back to music, is included in pretty much every write-up about Terry, including this obituary from his hometown paper, the Chicago Herald Tribune. In a Guardian article/interview by Tom Huron, following Calliers death in 2012, Pillar himself tells how this came about. Hey, wassup? It’s Terry, Callier, I got a new way to flow for Ordinary Joe, you know! His work continued with Beth Orton, and not just samples, as is often suggested, but entire new tracks and collaborations, like “Bother to Brother” with Paul Weller, released on UK label Mr Bongo , the haunting Love Theme from Spartacus with north London duo Binns, Hardackers, Zero 7 who became a leader in the then emerging Chillout scene; and many more. It’s the collaborations with Massive Attack though that are the best for me, especially the music, lyrics and video for Live with Me. Callier, like many others, including Alexander O’Neal have found the UK Soul, Jazz, Dance music scene much more compelling than the USA. It’s geographically smaller, much more diverse, less racially profiled and it’s had a successful business span of 50 plus years, and continues today. It’s easier to perform live, you can get to most of it within day. Musicians and fans can stay home, or at the very least avoid flying to get to gigs. Word travels fast, and there is a national media who broadcast news and tv, that doesn’t require you to spend months on a tour bus in order to spread the word. Most of all the charts are not segregated. When you make #57, as Terry did with Love Theme from Spartacus, it was behind Madonna, Simply Red, RUN-D.M.C. and everyone else, not in a narrowly defined segment. Calliers real impact can be measured by the fact that the BBC, and the major British broadsheets(the serious papers), The Guardian , The Independent all ran obituaries as well as the New York Times, Most remarkable though, perhaps, was the 2012 Terry Callier Tribute Concert at the Islington Assembly Halls. The youtube video, below, captures the beauty of Terry and his music. His original version of Love Theme to Spartacus. Hear: Massive Attack tribute Windmill Hill sessions. See: Electronic Press Kit for Terry. 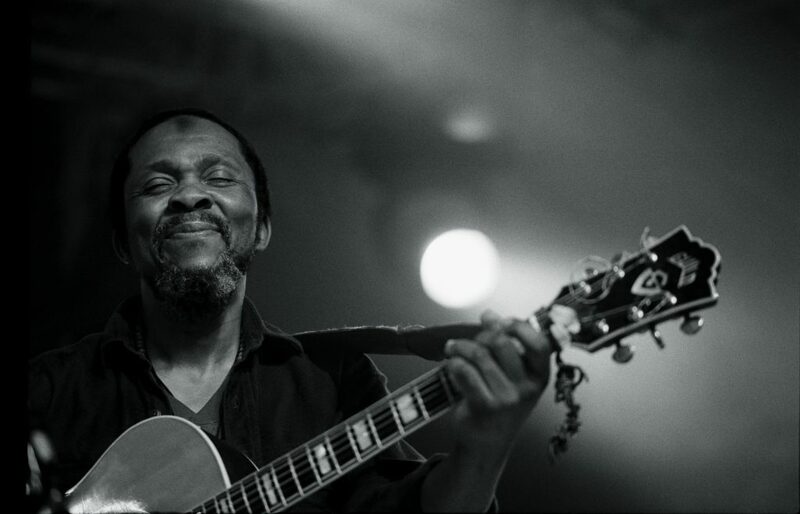 Terry Callier EPK from Alistair Batey on Vimeo. 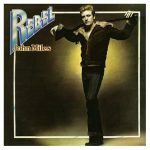 was the title of a great John Miles track from a 1976 John Miles album called Rebel. Strangely although I loved that track, it was one of the many I for the most part gave away, or sold for next to nothing in the Spring of 1983 when I moved to New York. I can remember to this day renting an estate car for the day and loading up the vinyl I wasn’t going to keep, and driving down to Kentish Town in London and offloading it all at some used record shop. Of the some 2,000 albums I have now, I’ve been working through the general soul, jazz, dance, and disco albums from A-Z, over the last 2-years. I’ve learned a lot, and often go back and remaster favorite albums. Remastering music, often involves compromises, since we’ll never hear the music as clearly as the musicians and engineers did at the time of recording. Not only don’t we have the instruments in front of us, we don’t have the same range of speakers. Even the music on standard commercial CDs is encoded at 16 bits, versus 24-bit recording in the studio. Still, I think I’ve finally made a breakthrough. I’ve always recorded at 4800hz, 24-bit, but finally I did an album today that’s as good a the same album on ripped from the CD version at 24/4800. Vinyl to digital: final it’s taken me from Alexander O’Neil to late in the P albums to finally re-master a vinyl album to what I consider to be nearly as good as the CD version. I figure that’s some 200 albums. Many of them were poor quality, scratched up, a couple definitely smelt of party beer from the 70’s (I don’t like beer!) and even with a rigorous cleaning, they were never going to sound like CD’s. Every now and again I buy an MP3 Version of a track from Amazon to compare with the ones I’m doing. While most are good, or better than mine, some from Amazon are poor quality copies of vinyl albums, you can even hear the clicks, amazingly. I know I’m saving to MP3 which isn’t optimal, but it works everywhere. M4A would be a better choice, smaller files, and better quality. However, they won’t play in my car, so MP3 it is. That said, I keep all the original recordings of albums in .WAV format files, which means I can always start over. Also, since I keep the Audacity project files, I can also export M4A files if I want. 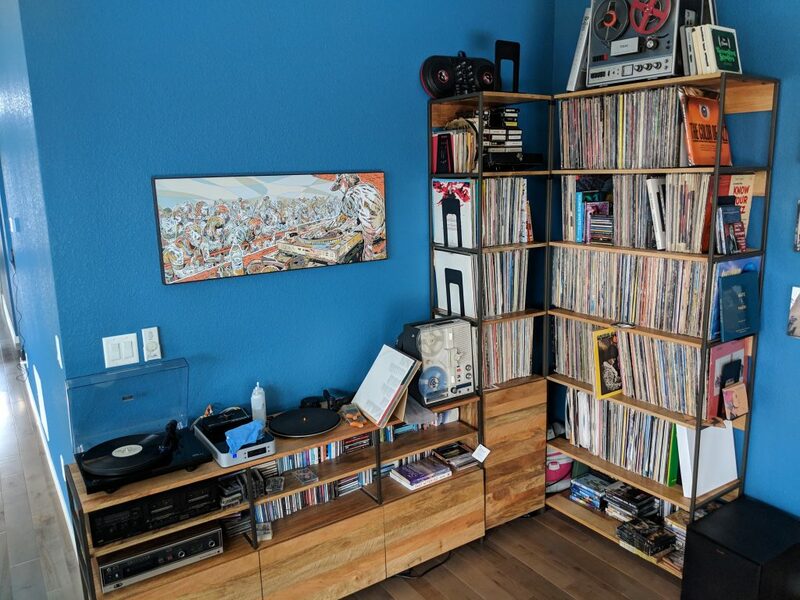 I’ve spent the last year plus digitizing my vinyl collection for personal use. I’ve done all my general soul/jazz/jazz funk and disco artists from A-K. Which in total is only about 1/4 of the collection. I spend a lot of time hunting both in person and online for affordable but good quality albums on the Creed Taylor CTI and Kudu labels. I have all but two of the Kudu label, I’ve had more than 50% of the label output since the late 1970’s. I’ve also had probably 40% of the CTI label. Buying the remainder has been a fun, rewarding experience, I’m working on ideas for the 50th anniversary of the labels in 2020. I’d love to get some of Creed Taylor’s “crime” stuff for Secret Agent. I’ve had all four of the Hopkins/Taylor concept albums for a few years, but aside from the Sound of New York, never played them. They were really only there for completeness. While you can get some of the albums from specialist UK outlets Sounds of the Universe and Boomkat as downloads, they just don’t have the same atmosphere as the original mono albums, and especially after some re-engineering. I was delighted to see four of the tracks in the SOMA FM Secret Agent by spins chart this week. The four albums I’ve worked on for SOMA FM are as follows, interestingly these albums are not mentioned in either the Kenyon Hopkins or Creed Taylor wikipedia entries. I’ll have to see what else I can find out about that period. It is remarkable to me that Creed Taylor, possibly one of the key people behind the early Jazz > Funk evolution in the early 70’s was working on these soundtrack style albums 20-years earlier. You can sample the albums on youtube, you can buy MP3 downloads from Boomkat, or listen in on SOMA FM Secret Agent. I saw the following tweet and literally laughed-out-loud. In the past two years I’ve got to the checkout confirmation step on music and theatre events and cancelled out and closed the browser window more times than I care to remember. Ticket “fees” and “convenience” charges are rampant. The airline industry over the past year has gone the complete opposite direction, some forced by legislation, some by marketplace competition. They nickel and dime you for charges for everything. The Trump administration has rescinded a rule requiring Airlines to disclose baggage fees upfront. This rule previously made it easier to compare airfare prices across airlines. In my medium feed at the weekend was a link to a post titled “British skinheads in the 1980s were young, pissed, and stylish as hell“. I scanned through the pictures, read the accompanying text, and see just a very small slither of a culture and a style that I and my friends wouldn’t have been associated with in 1972, and would have rejected. Yeah some of us were involved it fights at Football matches, it was of it’s time. As I sit here today, my clothes are still inspired and styled by those days, I’m even comfortable with a #1 haircut. 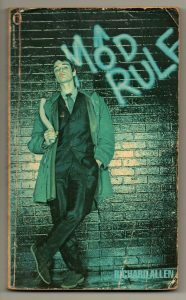 While Richard Allens books Skinhead, Suedehead, Boot Boys, Skinhead Escapes, Smoothies, Terrace Terrors, Boot Boys and the final Mod Rule chronicled a generation, it’s unlikely that any single person experienced more that a few of the fictionalised events as youth culture was moving too fast. Where I grew up in Hemel Hempstead we were almost exclusively white, and with London our nearest big city which had been hugely multicultural, for hundreds of years, racism just wasn’t a thing. So the toxic, hatred filled skinhead imagery of the 1970’s – 80’s just doesn’t ring true for me. There are a few interesting videos online, two of the best by Don Letts. Letts was the DJ at the Roxy Club and before that, Chaguaramas, and we were there on New Years Eve 40-years ago at the Clash gig, we walked out, our time had passed. Letts films, especially the story of Skinhead, and it’s predecessor, the Fred Perry Sponsored, Subculture of British Music and Street Style take a serious look at the genre. I’d love the chance to talk to Don one day.